Officially the air defense of the United States has completely failed on 9/11 – not once, not twice, but four times in a row, while a whole slew of war game exercises were taking place simultaneously during the time of the terror attacks. Furthermore, the Continuity of Government plans were activated that day – after two decades of preparation. Many essential questions related to the „mythical historical narrative“ (Zbigniew Brzeziński) are still not investigated at all. An exclusive interview with German researcher Paul Schreyer. Paul Schreyer was born 1977 in Ahrenshoop, Germany. He is a freelance journalist for the German magazines „Telepolis“, „Hintergrund“ and „Ossietzky“, as well as author of the German written book „Inside 9/11“. Related to the terror attacks of September 11, 2001 he has published also this website in English and German: http://www.911-facts.info/, and these videos: „Inside 9/11 – Who controlled the planes?“, “Inside 9/11 – Hijacking the air defense”, and “Inside 9/11 – Obstructing the investigation”. Lars Schall: Mr. Schreyer, would you agree with me that the topic of the war games and the failure of the air defense on the morning of September 11, 2001 is the single most important issue related to the terror attacks of 9/11? Paul Schreyer: That´s true. What we call 9/11 is essentially four planes being hijacked and crashed in a two hour period of time. Therefore, the complete failure of the air defense during these two hours should be investigated in much more depth and detail than it has been by the 9/11 Commission. And regarding the war games, yes, it´s at least quite strange that exactly on 9/11 a military exercise was taking place that included a virtual hijacking. Actually it´s a bit more than simply strange, considering that the second big terror attack in the western hemisphere in the last decade, the 7/7 tube bombing in London 2005, was also happening precisely while an exercise testing a tube bombing was running. (1) To call this a coincidence one has to change the meaning of the word, I would say. L.S. : Why have you developed an interest in 9/11 in general, and in the above mentioned topic in particular? P.S. : 9/11 is still the biggest topic of our time. It started or accelerated major policy shifts in many countries. We still live under the influence of these policy shifts. That´s why you can´t act responsibly today as long as you don´t know what really happened on 9/11. We have to come clean with this history. It´s a simple matter of truthfulness. And the issue of the air defense that morning is apparently a key to the whole thing. It should be obvious to everybody. The Pentagon was being hit about 90 minutes after the first hijacking started. And still the strongest military power in the world should not have been able to protect its own nerve center? That has to be explained. L.S. : On the morning of 9/11 there were a whole slew of war game exercises going on. Can you tell us about one specifically, please – and that is “Vigilant Guardian“? P.S. : “Vigilant Guardian“ was a countrywide so called „transition to war“ exercise taking place between August 20th and September 13th, 2001. But only between September 10th and 13th it was planned to run 24 hours a day. Right on the morning of 9/11 the scenario contained a hijacking. That´s why the first phone call about a real hijacking made officers in the air defense headquarter wonder. One even said: „Somebody started the exercise early. The hijack is not supposed to be for another hour.“ It appears that the exercise somehow melted with reality. L.S. : Did those war game exercises made it more difficult to react to the terror attacks? P.S. : The 9/11 Commission Report, which mentions this whole exercise only once in a footnote, says no. And of course it´s true that the start of fighter jets should not have been obstructed by the exercise. Because it takes only seconds to verify if an event is real or exercise. But the role of „Vigilant Guardian“ might go deeper. For it allowed access to the radar data the air defense received. For example, as part of the exercise virtual radar signals were displayed on the screens of the operators in air defense headquarters. These signals didn´t represent real planes in the sky but were only digital points, so called „inserts“, to make the war game more realistic. In plain words, the radar data was intentionally manipulated. Therefore, assuming 9/11 might have been an inside job, the exercise could have been a useful cover for blurring the real radar picture and weakening the air defense very effectively. L.S. : At what time were those exercises stopped? P.S. : That´s in doubt. The military said they stopped it right after the first alarm at 8.38 a.m. But according to the tape recordings of the air defense there were virtual inserts on the screens as long as 9.30 a.m., meaning almost an hour after the first call to the military. (2) Actually it seems as if no one really stopped the exercise as long as the hijackings were in progress. L.S. : The hijacked airplanes showed strange flight patterns. Why is this of relevance? P.S. : You have to put yourself into the minds of the alleged hijackers. The smartest thing to do for them was to act as quickly as possible. To minimize any risk they had to get control of the planes a few minutes after takeoff and then direct them straight to their targets so that fighter jets wouldn´t have time to interfere. But that didn´t happen at all. Take the first airliner, Flight 11. The alleged hijackers took control at 8.14 a.m., but didn´t turn to the south to New York. Instead they flew to the opposite direction to the northwest for some 13 minutes. That detour made no sense, at least if you stick to the official version of events. And it´s the same pattern with all other 3 flights. Flight 175 – hijacked at about 8.45 a.m., then again a huge detour instead of turning directly to New York. Even more strange – Flight 77, the third plane, took off from Washington to target the Pentagon, that is just a few miles from the airport. Than why did it take a detour of over 500 miles or more than one hour flying time? That is absolutely crazy and unreasonable. And it´s still unexplained. L.S. : Related to Flight 77 there was something very odd going on with regards to a specific radar gap, correct? P.S. : Right. 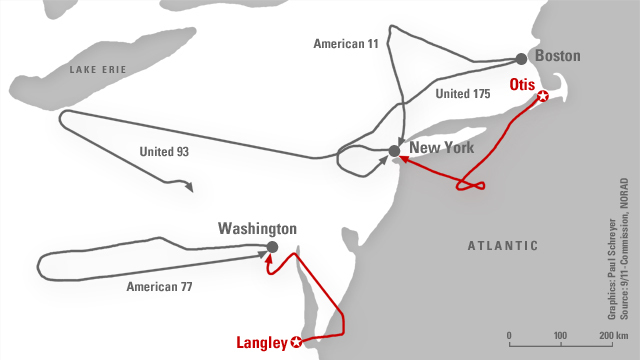 The „Washington Post“ reported that Flight 77 turned exactly at a small zone of poor radar coverage. (3) According to the official account they became totally invisible for about 9 minutes, just as the plane turned. And so they allegedly got lost to air traffic controllers. So this radar gap could have been the destination of the unexplained detour. If true, a new question arises. How should the alleged hijackers have known that the radar gap existed, where it was located and when they would have arrived there? Again no explanation is given for this. The whole complex of Flight 77 remains a miracle, at least as long as you´re trying to accept the official version. L.S. : Some people believe that the hijacked airplanes were “hijacked from the hijackers“ via remote control. What’s your knowledge about this question? Actually this seems to be the most probable version of what happened. At least it can explain many facts and anomalies, which the official version all sums up as coincidence or luck. Like the extremely precise approach of the plane hitting the Pentagon. Remember that it hit the building with full throttle only a few feet above the lawn. And that it hit the only side of the building, that had been renovated with steel- and Kevlar-strengthened walls and blast-resistant windows – just for the purpose of resisting a terror attack. That limited the damage effectively and is also the reason why there weren´t that many deaths as you would expect after a plane crash into such a big building. Apart from these considerations there is the technical aspect. And there it seems that remote controlling a large Boeing passenger jet was technologically absolutely possible in the year 2001. Again, I´m pointing to the detailed studies on this by Aidan Monaghan and Kevin Ryan. L.S. : In June 2001 there was an important change in the command structure taking place in connection to the interception of airplanes that are off-course (see the memo of the Joint Chief of Staff: “Aircraft Piracy and Destruction of Derelict Airborne Objects“). Who was calling the shots in that respect since that change – and therefore on 9/11, too? P.S. : According to this change of rules a few months before 9/11 Rumsfeld personally would have to give approval before any fighter jet could intercept in case of a hijacking. But Rumsfeld somehow disappeared from the chain of command right in the crucial hour. Therefore, many 9/11 researchers see this as a possible reason for the failure of the air defense – and as a smoking gun pointing to the role of the Secretary of Defense. But interestingly, the first fighter jets taking off on the morning of the attack didn´t need approval from Rumsfeld to start. The highest ranking officer giving approval was Major General Larry Arnold, commander of NORAD Continental United States, who was two ranks below Rumsfeld in the chain of command. Therefore, I doubt the practical significance of this rule change. But nonetheless, assuming 9/11 was an inside job, the rule change might have been one more safety step for the conspirators. L.S. : Even though there was a series of war games going on that involved primarily the US Air Force, do you have any doubt that there would have been still enough fighter jets available to intercept the hijacked airplanes? And if so, why didn’t it take place then? P.S. : That´s the real question. If you study this thoroughly you see that there were indeed enough fighter jets available. They had Andrews Air Force Base, 10 miles out of Washington, with fighter jets to protect the capital. But Andrews did nothing at all. The first armed takeoff was allegedly no sooner than 10.38 a.m., an hour after the Pentagon crash. Then they had two jets on alert in Otis Air Force Base, alarmed at 8.38 a.m., 25 minutes before the second tower was hit. And they had two on alert in Langley Air Force Base, alarmed at 9.09 a.m., 28 minutes before the Pentagon was hit. In both cases the combined takeoff- and flying-time to target would have been about 20 minutes. So technically they could have intercepted both planes. But strangely in both of these cases the fighter jets were flying unexplained loops and detours that delayed their arrival significantly. In effect the fighters from Otis and Langley didn´t need 20 minutes to reach their respective targets but unbelievable 50 minutes. Then who was responsible for those loops and detours? Who gave those orders to the fighter pilots? That´s still an open question. All we know is that the tape recordings of the communication with the pilots got lost somehow. L.S. : Two men had their first day of work on 9/11 that are of interest related to the topic of our interview. Who were they, and why is this of interest indeed? P.S. : First there was Ben Sliney, national operations manager of the civilian air traffic control. For him 9/11 was his very first day on the job. And then there was Captain Charles Leidig, deputy director of the Pentagon´s National Military Command Center, NMCC. The NMCC is the focal point of decision making in the Pentagon during an urgent crisis. The acting boss of the NMCC, General Montague Winfield, had asked his deputy, Captain Leidig, right the day before to take control of the NMCC on the morning of 9/11, more precisely from 8.30 a.m. on, meaning right at the start of the attack to come. One more so-called coincidence. Because Captain Leidig was inexperienced. He had qualified for the complex job of managing the command center only one month before. For unknown reasons he failed to establish a phone conference with civilian air traffic control, while General Winfield, who should have taken command, had simply disappeared. Only after 10 a.m., when the attacks were over and the last plane had crashed, Winfield returned to his desk at the NMCC. The episode of his well-timed absence is also unexplained so far. L.S: What happened to General Winfield after 9/11? P.S: Actually he was promoted soon thereafter. And by the way, now in 2012 he even became Deputy Assistant Secretary of Defense. Captain Leidig was also promoted after 9/11. L.S. : A strange role on 9/11 played a man by the name of Robert Marr. Why should people know exactly what he did that day? P.S. : Actually there were only few people managing the immediate reaction to the attack. Basically these were the just mentioned Ben Sliney at the civilian air traffic control, Captain Leidig at the Pentagon, and Colonel Robert Marr at the military air defense. On 9/11 Marr was commander of NEADS, the north east sector of the NORAD air defense system. Because all four hijackings took place in the north east sector, Marr was responsible for sending fighter jets in all these cases. He scrambled the F-15s from Otis and the F-16s from Langley. But both of them started with unexplained delays. The Otis jets took off 3 to 4 minutes later than they could have, the Langley jets even 15 minutes later. These were the fighter jets that missed the second World Trade Center crash and the Pentagon crash. In 2011 I made a video presentation (6) about these delays and the role of Colonel Marr and got a response to this from Miles Kara, former staff member of the 9/11 Commission, who made much of the official research regarding the failure of the air defense. Kara says that I´m wrong with my allegations about Marr and that one could only have done better with hindsight and that Marr acted totally reasonable on 9/11. I can´t prove the opposite. I have to admit that it´s possible that Marr´s behaviour has innocent explanations. But considering the lack of transparency on the whole issue you have to question that. So much was covered up regarding NEADS and their communication that day. For instance, the lost tapes I mentioned. And it´s really inconceivable that we still don´t know who diverted the fighter pilots from Otis and Langley to their strange detours. Maybe Marr didn´t know what was going on. However, there were people who gave those confusing orders to the pilots. L.S. : Where was then-Defense Secretary Donald Rumsfeld when the U.S. was under attack? P.S. : Good question. Where was he? Why didn´t he walk over to the National Military Command Center inside the Pentagon immediately after the second tower had been hit? Rumsfeld stayed away from the Command Center just between 9 and 10 a.m., exactly when his leadership was needed most. A parallel with the earlier mentioned General Montague Winfield. L.S. : Do you think it is of central importance what happened in the Presidential Emergency Operation Center (PEOC) of the White House related to Richard Cheney? P.S. : It is. And the 9/11 Commission Report is misleading, to say the least, about Vice President Cheney´s actions in the PEOC, which is the bunker beneath the White House. It starts with the disputed time of his arrival there. Officially this was as late as 9.58 a.m., five minutes before the last plane crash. But according to the statement of then Secretary of Transportation, Norman Mineta that´s in doubt. Mineta asserted that he arrived at 9.20 a.m. in the bunker and saw Cheney already there. He even witnessed Cheney´s military aide coming in and saying: „The plane is 50 miles out – do the orders still stand?“ With Cheney answering: „Of course, have you heard anything to the contrary?“ Mineta says, the time of this conversation was about 9.25 a.m., meaning 12 minutes before Flight 77 crashed into the Pentagon. And if you look at the radar reconstruction of that flight, as released by the National Transportation Safety Board, you see that it was 50 miles out of Washington at 9.27 a.m., indeed. So Mineta´s statement is corroborated by officially accepted radar data. Now, we still don´t know what those orders were, Cheney´s aide was asking about. But clearly they had something to do with that flight approaching the Pentagon. L.S. : On 9/11 the plans of “Continuity of Government“ (COG) were activated. (8) Is this also of critical importance? P.S. : It seems as if COG is the center of the whole 9/11 issue. Possibly this is what it was all about. You have to look at it from a distance. 9/11 allowed major policy shifts in some important areas. First it led to a big boost in defense spending. Second, as everybody knows, it caused public support for energy and hegemonic wars in Afghanistan and Iraq. But perhaps the most important strategic opportunity of 9/11 was to strengthen the executive branch and presidential power in general and to weaken congress and democratic participation. All of this was exactly the agenda of Cheney, Rumsfeld, Wolfowitz and their associates before 9/11. And now we come to COG. The widely secret plans for „Continuity of Government“ were born in the cold war and should ensure that the country could be governed even after an assumed Russian atomic bomb had destroyed Washington and killed all political leaders there. Therefore, COG called for a parallel structure of executive officials located outside the capital taking over the government after such a deadly strike. But with knowledge, access and criminal energy people at the top could use COG of course also for some kind of coup d’etat. You really don´t need that much fantasy to imagine a national emergency as cover for a partly suspension of democratic structures. It has happened often enough in history. And presumedly this is exactly what occurred on 9/11 – or at least what was planned, assuming the attack was an inside job. As we saw, it didn´t fully succeed at first. Flight 93, the fourth hijacking that morning, didn´t reach its planned target which was probably the White House or the Capitol in Washington. If it had hit, politicians would also have been killed. So this shadow government of about 100 people outside Washington, activated by Cheney on 9/11, was at work at least for months. No one informed the public if and when it was stopped. Even Congress wasn´t aware of it until the „Washington Post“ had made it public 6 months after the attack. All we know is that Cheney had a secret parallel executive structure at hand since 9/11. No one has investigated the actions of these people so far. L.S. : Thank you very much for taking your time, Mr. Schreyer! 1) As to whether there were enough fighter jets available although a series of exercises were held, the answer is crystal clear: yes, and the reason is of utmost importance because it is the core of the air policing system that was introduced and practiced since the 1950s in all NATO air forces – initiated by the US. Each air force squadron (or wing) that has the task of air policing has a horde of two fighters that are held on alert 24 hours every day of the year exclusively to fulfill this task. As a rule, the machines must be in the air 10 to 15 minutes after the alarm. This process is called in NATO air force „alpha scramble.“ These crews and their machines do not participate – under any circumstances – in exercises. Even if the squadron will be used for any other activity, this does not happen without an assignment of the air policing to another squadron for that specific time. In Germany for example, this task is carried out by the Fighter Wing 71 in Wittmund (airspace north) and 74 in Neuburg (airspace south). 2) The change of the rules which are mentioned in the interview (the need for an approval for “alpha scramble”) is remarkable by itself, because it contradicts the practice that was conducted since decades. This practice knows deliberately no hierarchical command structures, but instead relies on the principle of fire service or ambulance, whereby delays of interception missions should be avoided. 3) No air traffic controller that is employed for the simulation process of an air force exercise will – under any circumstances – undertake at the same time parallel tasks of the normal civilian or military flight operations, and vice versa. This would be not compatible with the principles of flight safety. If it should have been the case that an air traffic controller received virtual signals / false blips on the radar, this would be an indication that someone (with access to the radar system) wanted to cause deliberately confusion. (7) Lt. Col. Robert Darling, „24 Hours Inside the President´s Bunker. 9-11-01: The White House“, Bloomington 2010, p. 109.